Luxury and Romance in the Lush Rainforest and Beach Setting. 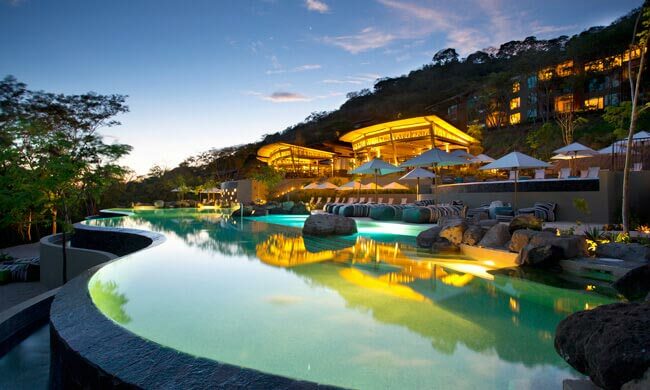 Treat yourself to an unforgettable Costa Rican romance and stay at two famed luxury hotels. Enjoy romance, elegance, and atmosphere during the vacation of a lifetime in this charming country! 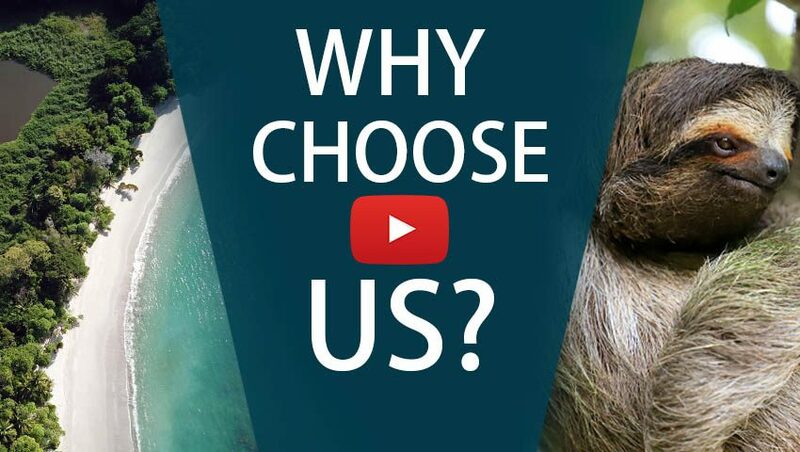 Begin your trip at the Tabacon Grand Spa Thermal Resort. Relax at the famous on-site hot springs and award-winning spa, or check out one of the many adventure tours in the area. From zip lining to rafting, the adventurous will find plenty to keep busy! After three days of exploring the Arenal volcano area, it´s time to move on to Guanacaste to experience the Andaz Peninsula Papagayo Resort. Here you can do some water sports, explore the beaches, or relax by adult-only cascading pools. The newly built hotel is a stunning fusion of modern design and Costa Rican character. Day 1: Ready for Costa Rican romance? One of our representatives will meet you at the San José International Airport where you’ll receive all the information about your trip. A private shuttle will then take you to Tabacon Grand Spa Thermal Resort in Arenal. Relax in your suite at the Tabacon Grand Spa Thermal Resort. Lounge in the hotel’s endless cascades of hot springs, explore the adult-only Shangri La Gardens, treat yourself with a relaxing massage in the open-air bungalows, or just listen to the sounds of the surrounding rainforest—an award-winning spa experience. Visit the town of La Fortuna where you can choose what suits you best from a myriad of different area activities such as zip lining, white water rafting, hiking, birdwatching, and horseback riding. A private transfer will take you to the north Pacific coast, where you will stay at the beautiful Andaz Peninsula Papagayo Resort Costa Rica. Use these days to relax by the pool, go on a sportfishing day trip, take a dive tour, or visit an active nearby volcano—Rincón del la Vieja National Park—for a day full of adventure. Take a private transfer to Liberia airport where you will catch your flight back home. The Tabacon Grand Spa Thermal Resort is the perfect oasis for those looking for luxury amenities and the ultimate spa experience during their stay near Arenal Volcano. 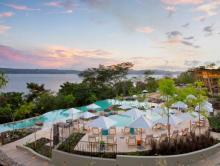 Andaz Papagayo is an elegant, boutique-feel beach resort with fantastic service and dining. Discover Costa Rica's best areas in this seven-day package: visit hotsprings near a volcano and unwind in an all-inclusive resort by the beach. Retreat to the most luxurious hotel in Osa Peninsula, one of the most biodiverse locations in Costa Rica, for some serious rest and decompressing.